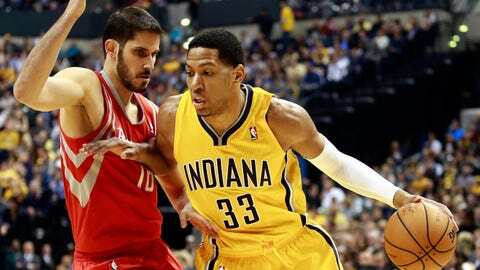 Danny Granger received a standing ovation when he made his season debut late in the first quarter. INDIANAPOLIS (AP) Paul George had 24 points and nine rebounds and Lance Stephenson added 16 points, leading the Indiana Pacers to a 114-81 rout of the Houston Rockets on Friday night. The Pacers ended their only two-game losing streak of the season and maintained their grip on the Eastern Conference’s best record (21-5) with their most lopsided win of the season. Dwight Howard finished with 19 points, 12 rebounds and five blocks for the Rockets. James Harden, the NBA’s No. 6 scorer, was held in check most of the night by George, finishing with 12 points on 3-of-14 shooting. The Pacers, who lost their first home game Monday night, never gave the Rockets a chance. After Indiana took a 12-11 lead, it never trailed again. The Pacers extended their lead to double digits in the second quarter, to 26 in the third and 36 in the fourth. The featured attraction – Howard vs. Roy Hibbert – was almost as one-sided on the stat sheet as the game was on the scoreboard. Hibbert finished with nine points and six rebounds. But on a night that the Pacers made a season high 12 3-pointers, got a morale boost from Granger’s return and Howard’s teammates struggled to keep up with Indiana’s suddenly strong shooting, Hibbert and his teammates happily ceded the individual battle to Howard. They were more concerned with trying to put distance between themselves and Miami in the battle for home-court advantage. And they did it by holding one of the league’s best offensive teams to 38.1 percent shooting from the field and a season-low point total. The bigger problem was Indiana, which was determined to change course after losing back-to-back games. Indiana led 25-20 after one, made it 41-29 early in the second and then fended off Houston’s only real challenge, a 10-0 run that made it 41-39, by closing the half on a 17-6 burst to make it 56-45. The Pacers quickly made it 64-49 in the third, sealed the game with a 17-4 spurt and led by as many as 33 in the fourth. Reserve Luis Scola chipped in with 13 points for Indiana.